Sen. Patrick Leahy reads a letter from FBI Director James Comey at a campaign event Sunday in Winooski. 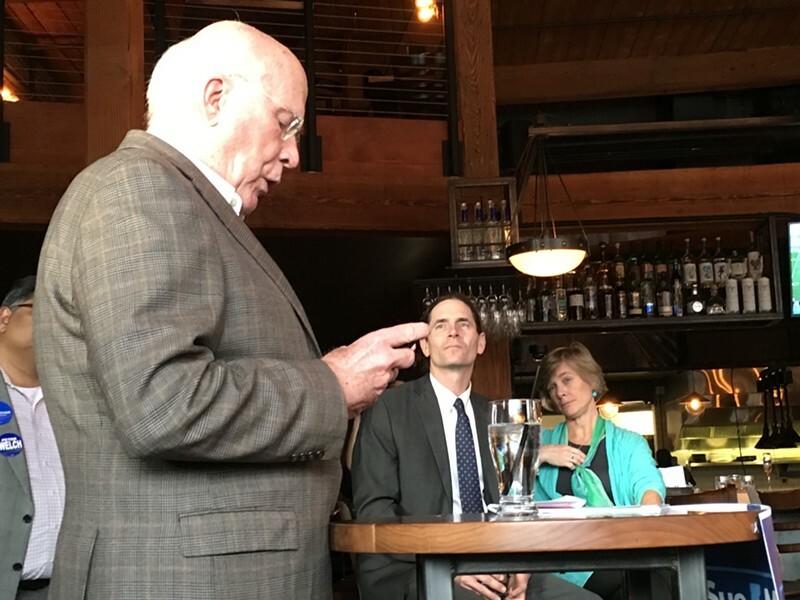 Sen. Patrick Leahy (D-Vt.) broke some news Sunday afternoon as he campaigned with Vermont's Democratic ticket Sunday afternoon in Winooski. A few minutes into his prepared remarks at Waterworks Food + Drink restaurant, the ranking member of the Senate Judiciary Committee pulled a smartphone out of his pocket and told a crowd of three dozen supporters that he had received an "extremely important" email "in the last few minutes." "I thought you might be interested if I read it," he said, pausing as he searched his inbox for the message, which had not yet been reported on by the national news media. The letter, which Leahy proceeded to read in full, was an update from FBI Director James Comey, who had stunned the political world a week earlier with the news that his agency had discovered new emails on a laptop owned by former congressman Anthony Weiner involving Democratic presidential nominee Hillary Clinton. In his update, according to Leahy, Comey told top members of Congress that an expedited review of the new emails had found nothing requiring further law enforcement action. "Based on our review, we have not changed our conclusion that we expressed in July with respect to Secretary Clinton," Leahy read as a rapt audience of Democrats listened closely. Audience members let out a roar of approval. "The letter is signed James B. Comey, director of the FBI," Leahy continued. The assembled Democrats cheered again. "I won't add to what was said because the fact is, I've always believed in Hillary Clinton's honesty," Leahy continued. "I've always supported her. The fact that [Sen. Bernie Sanders (I-Vt.)] and I have gone all over the country and elsewhere for her shows that we can unite this [party]." A moment later Leahy concluded, "You know, once in a while it's nice when everything comes together."